If you just utilize one of the methods mentioned within on a consistent basis, you could easily double or triple what you earn as a freelance writer. 7 ways to market for freelance writing jobs most freelancers have never heard of – you’ll decrease the competition and increase your chance of landing more gigs! I've been a freelance writers since 1993. 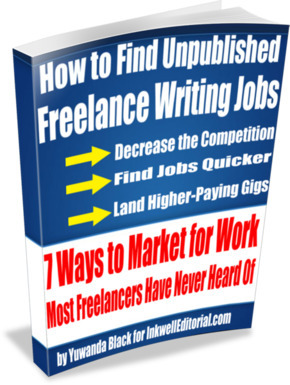 In this ebook, I discuss seven tactics I use to find freelance writing jobs. I manage to stay pretty busy as a freelance writer. And, even when I’m not, I don’t worry because I know that the way I market is counter to the ways others market. What I hope you’ve taken from this ebook is that there is enough freelance writing work out there for everybody. Most freelance writers who fail at this profession do so because they never learned how to effectively market for work. This ebook helps you to develop the mind of a marketer. No matter what business you’re in, a sale has to take place before anything happens. Before a sale can take place, you have to canvass (ie, market) for prospects. Whether you’re selling jet planes or web design services, marketing is the one thing that all business owners (eg, freelance writers) must know how to do to be successful. Couple this with consistency – and you have a winning formula. If you just utilize one of the methods mentioned within on a consistent basis, you’ll be well on your way to developing a successful freelance writing business. I decided to write this e-book for several reasons. (i) First because many existing and aspiring freelancers email me asking how to go about finding freelance writing work. This made me realize that the problem many freelancers have is their inability to effectively search for assignments beyond the standard freelance writing sites. I mean, many are just paralyzed. They have no idea how to take the first step, ie, where to start looking for work, whether to market online or off, what niche to target, how to compose a proper query letter/email, etc. We’re talking wholly and completely lost. (ii) The second reason I decided to write this e-book is because I tend to stay relatively busy. This leaves little time for responding in-depth to questions and emails from readers who write in. Many need much more help than the advice I can fire off in an email on a given work day. They need a tutorial – ie, this ebook. Being a freelance writer for many years has taught me how to market outside the box, so to speak. (iii) The third reason I wanted to write this ebook is because information gets buried. I’ve dispensed a lot of information over the years on how to find freelance writing jobs – on my website, on my blog, in articles distributed to article marketing directories, in guest posts on other blogs, etc. But, information gets buried – never to be read again. I liken it to the news – what’s hot one day is forgotten the next. This ebook puts all of the tactics I’ve discussed over the years – and still use -- in one place. In essence, this is a handy reference guide on how to find freelance writing work. You’ll probably come back to it again and again, so feel free to print it out, punch holes in it and file it in a binder for easy, future reading. Length: 42 hard-hitting pages on how to market for freelance writing work.